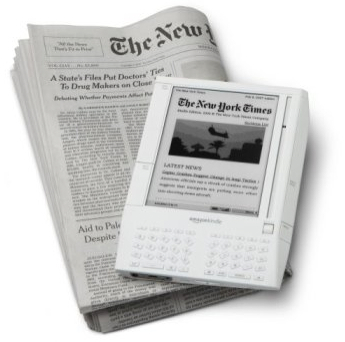 The Atlantic Monthly opens the ring for argument over the impact of Amazon's new Kindle. With a sleek new design and better features, some are saying this may be the instrument to nail the door shut on the codex. I have my doubts on that. I'm standing strong and stating publicly (and loudly) that I will never buy one. Alas, I'm afraid my voice will be like a lost bird chirp in the wind. Read for and against from the AM. I had an interesting chat a few years ago with a museum archivist who said that paper was the best medium to keep information because it's relatively independent. All you need is a climate controlled space, clean hands and you keep paper protected for decades. If you have text on a floppy disc, not only do you have to have the floppy disc, but you also have to have the computer that plays floppy discs. With our ever-changing technology, you can imagine how difficult (and space inefficient) this is. I bring this up in relation to my thoughts about marginalia and how important these insights can be to understanding writers and their written work. For example, The Tempest is fascinating and clearly influential to Sylvia Plath's Ariel collection. How much more interesting this connection becomes, however, when you read the marginalia. Deeper insight and great understanding are possible as a result of reading what Plath thought about specific moments, characters, bits of language in Shakespeare's play. What do we lose when we jump on the technology bandwagon? Granted, there is much to be gained, and I admit that I am tempted by the Kindle, but what happens to our society and, more importantly, to posterity's view of our society when we become physically intangible and go digital? These are interesting questions, ones that will not be answered for the foreseeable future, but ones that I think beg contemplation. Print will never disappear completely, but it may diminish in prevalence. How will this ultimately affect our reading selves?